This is a sturdy little Bulldog with large, erect, rounded, bat ears, a flat, powerful muzzle and a pug nose. The square flat head is not as massive as the English Bulldog"s. The forehead is rounded. Height doesn"t matter as long as the dog is well balanced. The height at the withers should be approximately the same as the length from withers to tail set. The dog should be pear-shaped, with the shoulders wider than the tail area. The short, soft, easy-care coat comes in brindle, fawn, white and combinations of brindle or fawn with white. The skin is soft and fairly loose, making the dog very pleasant to pet. The prominent round eyes are dark colored and the bite is undershot. The tail is either straight or cork-screw. 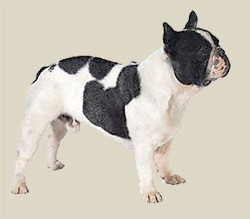 The Frenchie has minimal exercise requirements, although it is a fun-loving dog. It enjoys a romp outdoors, but it doesn"t do well in hot, humid weather. Most cannot swim. A short walk on lead is sufficient to meet most of its physical needs. This breed should not live outdoors. The Frenchie snores and may wheeze and drool. It requires minimal coat care, but its facial wrinkles should be regularly cleaned.